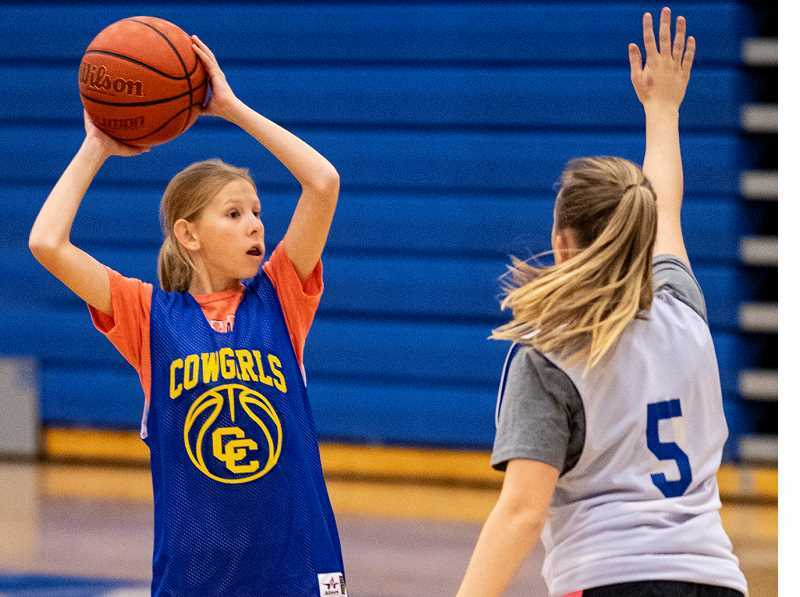 In recent years, the Crook County Cowgirls have struggled to find a way to win basketball games. Last year, the team finished with just a 5-19 record. Head coach Heidi Lea says that this year's team has a simple goal — win more games than a year ago. "Hopefully, we can get more wins than last year," she said. "That's our goal. We are looking forward to building our program with our JV coming in and our eighth-graders. We have young kids coming up, and that's what we want." The Cowgirl have just three seniors on their roster and no juniors. With such a young team and Crook County's move up to Class 5A from Class 4A, winning more games may prove to be a tall order. confident that this year's team is stronger than last year's. "You can see that the program is coming," she said. "Our talent that came in this year as freshmen are big. I mean we have three freshmen on varsity, and we have a bunch of freshmen on our JV, too." 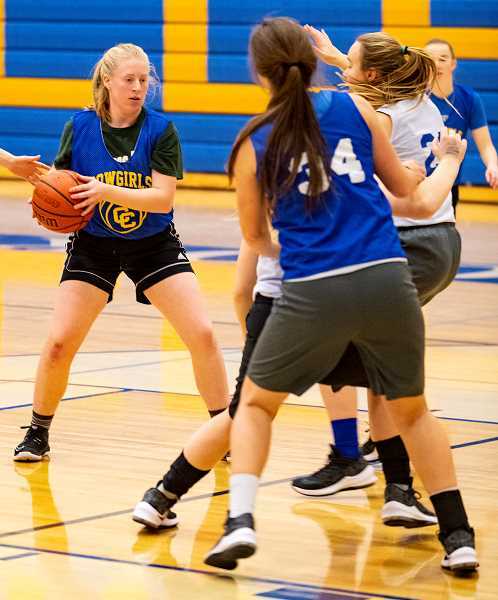 The three seniors on this year's Crook County roster are Mckinzee Mode and Heather Ptomey, who both played significant varsity minutes a year ago, and Makiya McCellan, who has no previous varsity experience. The team had a big loss before the season even started when returning starter and senior Gracie Kasberger injured her knee during the soccer season. Kasberger will not be available the entire season, and Lea noted that will be a big loss for the team. "Losing Grace, that's huge," she said. "She was one of our returning starters and probably would have seen limited bench time and a lot of playing time. Losing her has made a big hole." Still, even without Kasberger, the team returns a lot of players with varsity experience. Other varsity returners include sophomores Liz Barker, Teagan Freeman and Dallas Hutchins, who all started much of last season. Sophomore Syrie Ossenkop has also stepped up to the varsity level. The three freshmen on the varsity team are point guard McCall Woodward, forward Josie Kasberger, and post Emma Bales. Lea said that all three are expected to contribute immediately and to see significant playing time. Lea added that there are several more freshmen on the JV team who could contribute at the varsity level if necessary. With just 29 players out for the basketball team this year, Lea said that everybody in the program is expected to see plenty of playing time. "We told the kids that they are going to play five quarters a night just because we have young kids that need to play, and we don't want anybody sitting on varsity at all," Lea said. "We said that the only people that wouldn't see five quarters would be our three seniors and that's just because they can't." Lea said that the team is working hard to get better, and she is pleased with what she sees in practice. "They have been working really hard," she said. "Even over vacation we had a large number show up, so the kids are committed, and we are not having as much trouble with things coming up as we have had." The Cowgirls open their season tonight with a 5:30 p.m. game at Sisters. Although the two teams have played a number of games against each other in recent years, Lea said that she doesn't know what to expect as Sisters has a new head coach. "I think that we have to go in playing our game and keeping it at our speed and our tempo and not get in to what Sisters does," Lea said. "We know what they have back, and we know they have some speed, but we don't know what they are going to do. We just have to come out and play our best."